New Delhi, April 12: Congress party released list of seven candidates for Lok Sabha Elections 2019. The prominent names in the list includes names of leaders like Jyotiraditya Scindia and Manish Tiwari. 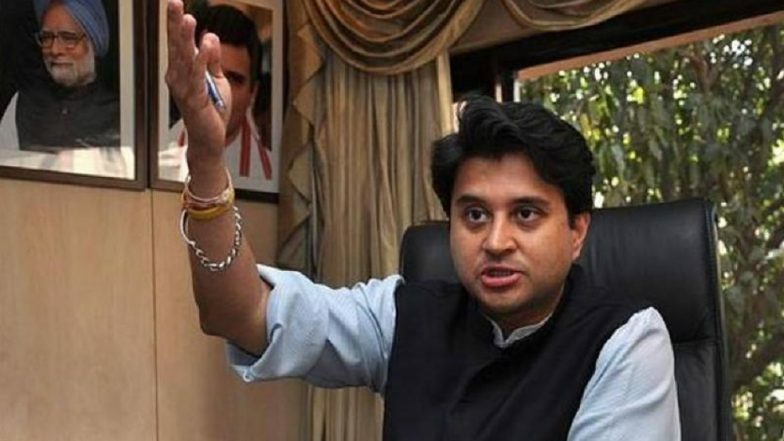 AICC General Secretary for UP East, Jyotiraditya Scindia, will contest from Guna Lok Sabha constituency in MP. Rahul Gandhi Death Threat: Green Laser Originated From Congress Photographer's Mobile Phone, Says MHA. The party has named candidates for seats from Bihar, Jammu and Kashmir, Madhya Pradesh and Punjab. Priyanka Gandhi, Jyotiraditya Scindia Meet Bhim Army Chief Chandrashekhar Azad, Admitted in Meerut Hospital. The Congress has named Shashwat Kedar from Valmiki Nagar in Bihar, Rigzin Spalbar from Ladakh seat in Jammu and Kashmir, Jyotiraditya Scindia from Guna in Madhya Pradesh, Shailendra Patel from Vidisha seat in Madhya Pradesh, Mona Sustani from Rajgarh seat in Madhya Pradesh, Manish Tewari from Anandpur Sahib in Punjab and Kewal Singh Dhillon from Sangrur seat in Punjab.